1.1 Introduction: what is food allergy? 1.4 What is a food allergen? 7.2 Which consumers are avoiding foods and why? 7.3 What information do these consumers need? 7.8 How can food suppliers ensure consumer confidence and trust? Allergens in food and their detection, management and elimination constitute a key issue for food manufacturers, especially in terms of safety. This book reviews current and emerging technologies for detecting and reducing allergens, as well as issues such as traceability, regulation and consumer attitudes. Following an introductory chapter by a distinguished expert, part one covers allergen management throughout the food chain. 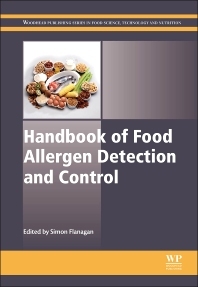 Part two details current and emerging methods of allergen detection in food, and part three covers methods for reducing and eliminating allergens in food. Finally, part four focuses on the control and detection of individual food allergens and the risks each one presents in food manufacture.